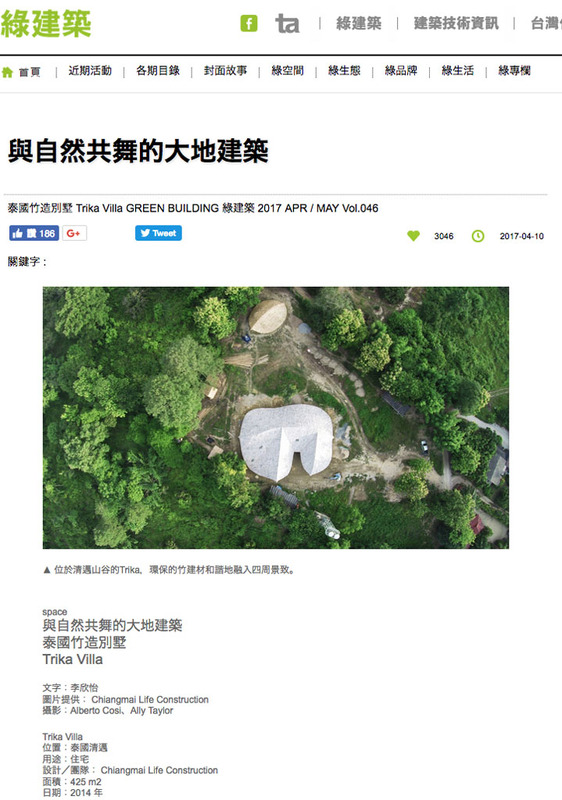 Our project formerly known as Trika Villa, now Eco G Resort in Chiang Mai is featured by the foremost Taiwan Architecture Magazine in Green Building. Initially the Trika Villa was conceived as a 5 bedroom private villa with all walls built from adobe bricks. Lots of niches for candles and other decorative items are carved into these earthen walls. The characteristic U-shaped roof entirely made from bamboo curves around a swimming pool. This designs integrates the water element with its sounds and reflections on the roof closely into the daily life of the inhabitants. This creates a cooling and relaxing atmosphere. The Trika Villa is an example of sustainability using bamboo architecture.